Here's tomorrow's schedule. Looks like a it's going to be a great fall soccer day. This is our last week. If you've not registered for the winter session yet, now would be a spectacular time to take care of that. Week 8 - Snow is good! Snow is fun! We will play! All for forecasts I see call for some light snow or a wintery mix for our U7 sessions. This is way better than rain! We have the most fun on days like this! It will be brisk. Please remember to dress your kids warmly. Gloves, hats, jackets, long underwear. This is our first weekend of questionable weather. We'll play if we can. I'll make the decision by 8:00 AM, and will post to this blog. We'll play as long as we don't have heavy rain. Yes, we'll play with light rain and even snow! If we do play, expect it to be cold and damp. Dress warmly! Long pants and long shirts under the uniform. You might want warm jackets too. If you have good gloves, bring them. Here's the planned schedule. 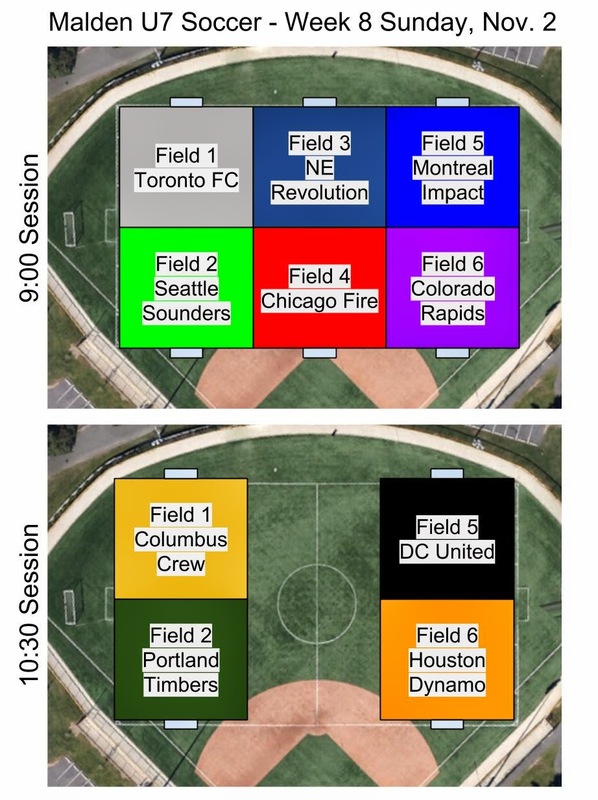 If turnout is light, we'll be forming makeshift teams and may combine fields at game time.